A man aged 21 was stabbed during a late night robbery by a group of teenagers in Kent. 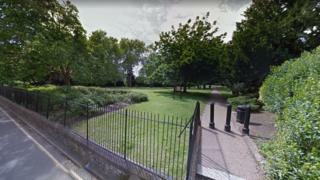 The victim was taken to hospital after he and a friend were attacked while walking home through The Vines, Rochester, at 23:30 BST on Saturday. It is understood the pair were returning from a birthday meal when they were confronted by about eight 15 to 18-year-olds. Kent Police are appealing for witnesses. The man had his mobile phone and coat stolen, while the second victim, a 19-year-old man, reported his phone missing after the assault.